Deserts hold a special fascination for me. In 2011, a road trip from Los Angeles to Las Vegas sparked my interest in those surroundings. That trip felt magical: Traveling to Las Vegas (receiving an award for my film Mutant Calculator there), and then back to LA for the West Coast Premiere of my film Menschenliebe, it was my very first time in California and Nevada. Watching Mojave desert outside the car’s window – a landscape I had only known from films beforehand – made me feel like I was in an entirely new, fascinating and foreign surrounding. 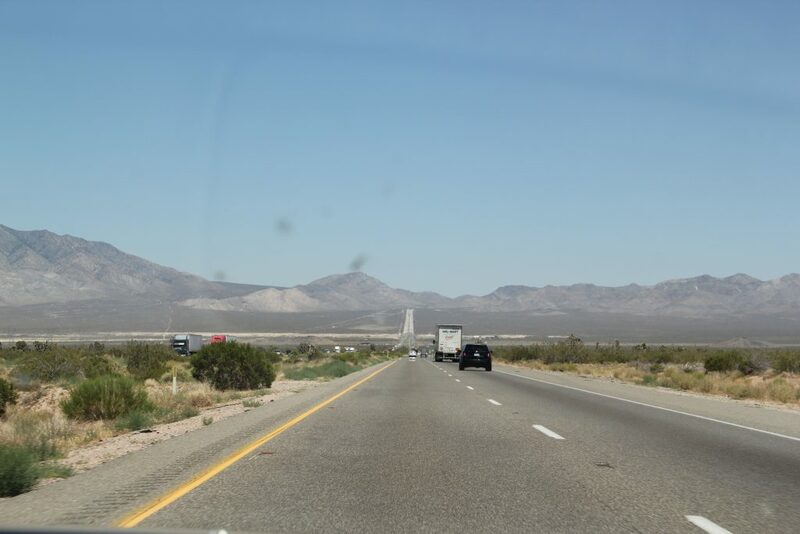 The very first photo I ever took of a desert, on July 14, 2011, on a roadtrip from Los Angeles to Las Vegas. While it’s a quick snapshot from a driving car – by no means a perfect photo – it has a lot of sentimental value to me. Ever since then, I have a tradition: Whenever I am visiting the US West Coast, I make it a point to explore the desert – in the past years, mostly with my friend R. Both of us had no background in desert hiking beforehand and met through our common passion for film. His writing on film is actually one of the main things that sparked my interest in becoming a filmmaker as a teenager; him and I share the same sensibilities and preferences, and are probably the only desert explorers who listen to the soundtrack to La Vacanza by Tinto Brass in our car while driving to ghost towns to explore what’s there… But that is a story for another post; let it suffice to say that the conversations during my US desert trips are probably among the most inspiring and pleasant I can imagine, another reason why I am always looking forward to such trips. A photo of a desert ghost town I took in 2015. 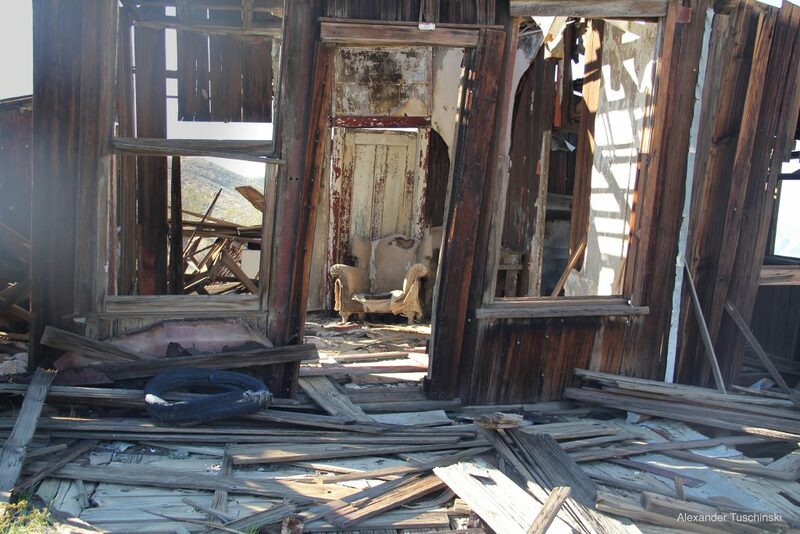 Exploring such places is very fascinating, as you never know what you will find there; in this case, the house still contained a nice chair, an old 1950s refirgerator and remains of a bed. The remains of man-made structures in the desert fascinate me particularly: Decaying structures, abandoned mining towns and rusty vintage cars have a certain “aura” around them that I find very interesting. Whenever I encounter them, I take as many photos and videos as I can. There is no special purpose for doing so – I have a whole hard drive filled with videos I took in various countries at various times, just filming interesting motives in interesting ways. In spring 2015 (while I was in the midst of filming my feature film Timeless in Germany), I had the idea to edit some footage I had earlier shot in various areas to Beethoven’s seventh symphony, creating a choreography of static objects, intercutting decaying structures and nature that’s taking them over. I edited very quickly, and after about three days, the film was finished. Editing felt like a “magical” process again, as I saw images and music “flow together”, all the camera moves I had done suddenly serving a purpose to underline the music… Beethoven’s seventh symphony had been one of my favorite symphonies for quite a while, and together with my friend and mentor Hugo Niebeling, I had already edited two of his films to that composition (although he used a different recording), so it was a nice opportunity to finally do my own film to this music that I knew so well. (The role of music in my films will be something I describe in later blog posts). The resulting film Gold. turned out to be very popular and was screened at many international events. At its world premiere at Mykonos Biennale 2015, after being screened in a beautiful amphitheatre, the film was awarded the “Golden Pelican” award, which was an incredible honor and one of the most wonderful moments of my life. 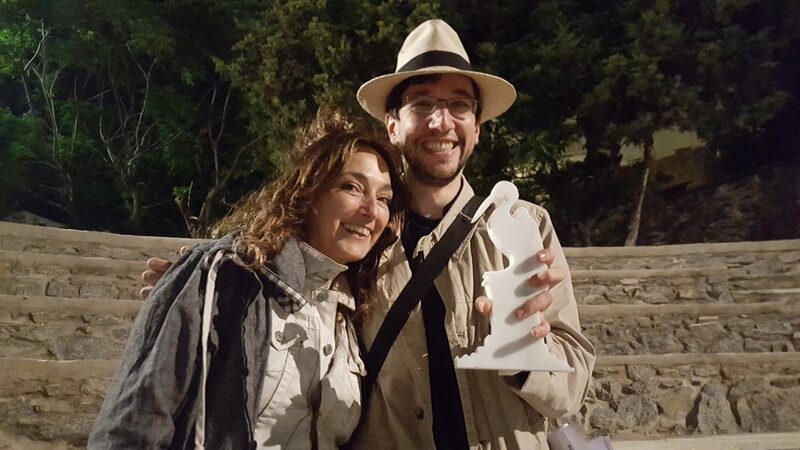 At Mykonos Biennale 2015, after receiving the “Golden Pelican” award from Lydia Venieri, the biennale’s president.